On Wednesday, June 17, 2009, the Israeli Army demolished seven houses of shepherds in the small village Qurusdyia in the Aqraba district, southeast of Nablus. About two months ago, the affected families had received eviction orders in Hebrew which they did not understand. Once the deadline had passed for the families to leave the area, the Army moved in with bulldozers and tore everything down. The families now live in tents in Aqraba and moved their livestock to fields nearby. The demolished houses consisted of three family houses and four farm houses. They were simple structures such as large tents, and three separate kitchens built with sheets of corrugated iron. According to the Mayor of Aqraba, about two months ago, the three families that were all related (3 brothers) had received eviction orders in Hebrew. They did not understand the content of these documents and did not inform the Municipality. Once the deadline for evicting the area had passed, the lawyers could not do anything to help. Qurusdyia lies in area C as defined by the Oslo Accord requiring building permits for any house or tent. These families have been living here for generations. The concept or the process of building permits is foreign to them. Everything but the well used as drinking water for the animals at this extremely remote site in the desert has been completely destroyed by the Israeli Army. Water canisters have been slashed, kitchens put out of function, and the water pipes severed. It appears that the families must have fled the scene in great haste since there were carpets left behind, children’s books half-way buried under rubble, a car toy, and a few shoes here and there plus many other small personal belongings. The Mayor pointed out that it is not so much the issue of losing houses, but rather of losing their land. People should be able to remain on their land. He seeks financial compensation through international organizations for any house that is being destroyed. 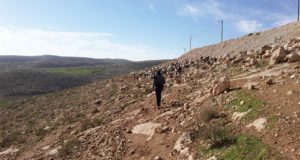 Aqraba (aka Akraba) in which Qurusdyia is located, has a total of 144,000 dunums of land, 80% of which have been taken by the Israeli Army for ‘training purposes’, as they claim. 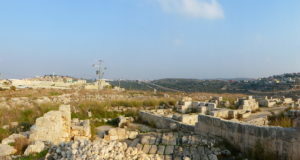 In reality, their objective is to build new settlements on these lands. Since 1967, Aqraba district is declared a Area C, but for a long time the people were allowed to farm; they have been treated worse and worse each year since, until they have gotten to the situation they are now in. The people living here are now being treated worse than before. 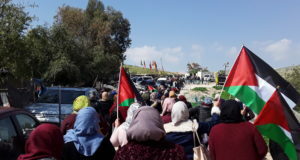 In Twael which is another small village in the Aqraba district, several houses including a mosque and a school have also been given eviction orders.